For those who claim that comics lack sufficient depth and complexity, fans generally recommend Alan Moore’s Watchmen, V for Vendetta and From Hell, Frank Miller’s DARK KNIGHT RETURNS and SIN CITY series, and Neil Gaiman’s SANDMAN series. These are considered “gateway” titles likely to convince skeptics that comics (often labeled “graphic novels” to lend them more gravitas) are a legitimate artistic medium for sophisticated and compelling storytelling for adults. While I never doubted this contention, I have inexplicably neglected this part of the SFF world for many years, and with no real justification. 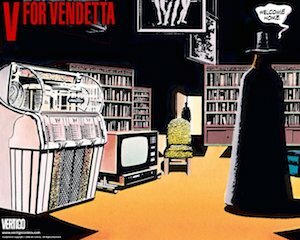 So after reading Watchmen recently and being completely blown away by its intricate storylines, meta-critique of the superhero myth, and perfectly articulated artwork, it was a no brainer that I would move on to V for Vendetta next. Well, V for Vendetta is a completely different creature than Watchmen. 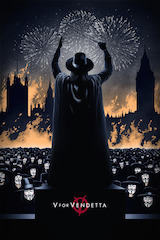 The cover image is absolutely brilliant: The knowing and enigmatic smirk of the Guy Fawkes mask is an iconic image of debonair anarchistic terrorism thanks to this graphic novel and the 2006 film. Having seen the film already, I knew what the story was about and had a clear image of the central character V and his love interest Evey Hammond. However, when I turned to the first page, I discovered that I really don’t like the artwork. All art forms are highly subjective and produce different reactions in all of us. In the case of Watchmen, I thought the artwork perfectly complemented the story and was precise, detailed, evocative, and pleasing to the eye. 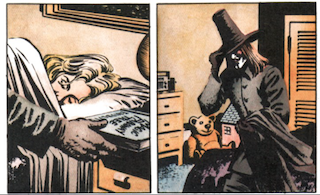 But something about the artwork of V for Vendetta just turned me off from the start. The coloring, which uses a very muted palate to match the dreary dystopian London of the future, may be effective but didn’t encourage me to pore over the images the way I did for Watchmen. And the impressionistic visual style just wasn’t what I was expecting. So while everyone’s reaction to the artwork will vary, this wasn’t for me. Now let’s get right to the story. 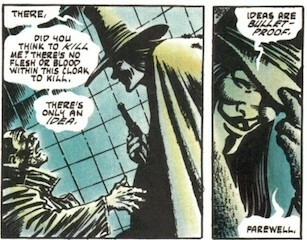 V for Vendetta is all about opposing political ideologies: fascism and anarchy. Since the setting is a grim fascist white supremacist regime that rules England after a nuclear war destroys much of the world, nobody should expect a particularly upbeat story. In fact, Moore makes this dystopian regime so distasteful and unpleasant that it’s pretty impossible to imagine anyone sympathizing with it, since it eagerly imitates the Nazis in exterminating all its political opponents, as well as minorities, homosexuals, and any other ‘undesirables’, in concentration camps. Now anyone who knows Alan Moore knows he is virulently anti-Thatcher and very skeptical about conservative governments and power elites of any kind. The entire book is a catalog of all the horrid things perpetrated in the name of social order and uniformity: the state’s motto is “Strength Through Purity, Purity Through Faith”. Really, it’s not very different from the current lineup of Republican candidates in the US presidential election, and Donald Trump would fit it quite nicely in this world. However, the only way to make a debate about political ideologies interesting is if both sides have some appealing aspects. Since Moore makes his dystopian England regime so odious, this isn’t really a fair presentation. And one of the most frustrating aspects of V for Vendetta is that the majority of characters are members of this fascist police state (driven by the Norsefire ideology), which is separated into different sections labeled “the Mouth”, “the Nose”, “the Eye”, “the Head”, and “the Finger”. And although I appreciate Moore’s artistic intent in humanizing the members of this government, exploring the inner lives of these people, the bottom line is they are part of a repressive, fascist regime. So it’s really, really hard to feel sympathy for them as V dispatches them with ease, one by one. It’s also impossible to care about their internal rivalries as them scheme to position themselves within the government. The far more interesting relationship is that between the enigmatic V and his innocent victim/love interest/protégé Eve Hammond. V is almost unbelievably quick, resilient, intelligent, cultured, and has directed all his considerable powers at overthrowing the fascist regime with targeted murders and bombings. He is a terrorist, but what a charming one. He quotes Shakespeare, speaks in iambic pentameter, plays the piano, and lives in his Shadow Chamber filled with the cultural treasures of the past. In him we can see all the artistic accomplishments that have been ground under the boot of the Norsefire ideology, leaving an empty-headed, crass proletariat. What he does to Evey Hammond in the name of truth and liberation is central to our judgment of his character. Give credit to Moore for making it difficult to paint V as a perfect vehicle for an anarchist ideology. Because I’m not even sure to what degree Moore sympathizes with V. He is a ruthless killer and many of his targets probably deserve what they get, but there are many innocents killed along the way. More to the point, V’s goals are very simple: destroy the fascist government of Norsefire, and allow the people to control their own lives and destinies in an anarchic society called “The Land of Do-As-You-Please”, which comes from a children’s book called The Magic Faraway Tree. V does not present a single detail about this wonderful society in which everyone agrees to participate in deciding the shape of society. It’s quite telling that the concept comes from a children’s book, since the vast majority of “functional anarchic societies” are just that: a children’s fairy tale. Before this ideal society is established, we have instead the complete chaos of “The Land of Take-What-You-Want”. While anarchy has a conceptual appeal to anyone who chafes under the rules of society, let’s think seriously about the alternatives. Communism has been tried and failed, at least the real world examples, while Marxists might argue that many attempts at socialism have been flawed. Instead, democracies have gained the upper hand in the last century, with strong links to free-market capitalism (I’m simplifying here, but bear with me). How many professed anarchists have proposed anything resembling a realistic, functioning society in which people freely decide the rules in perfect harmony, while still retaining complete control to “do as they please”. It’s pretty ridiculous. We all know that societies need rules to function; the key is to continually examine and adjust those rules to achieve the best balance of freedom and social responsibility. And representative democracy, despite all its shortfalls in concept and execution, seems to get us closer than other political systems. So I really do wonder exactly what Moore would like in his anarchic utopia. He is famously reclusive and curmugeonly, holed up in his small town of Northampton. I don’t imagine you can have a utopia made up only of comic book writers and artists. An anarchist society is bound to fail when it comes time to regularly plant and harvest crops, build sewage systems, maintain infrastructure, educate people, and punish crimes etc. So in conclusion I appreciate V for Vendetta for presenting fascism in all its ugliness and also painting anarchism in very ambiguous grays. But by stacking the deck and giving V such charm and culture, it’s really a bit unfair. Granted, Moore is brave enough to show that it’s easier to destroy than to create. But this story focuses so much on the people caught up in the machinery of fascism that I had trouble maintaining interest. It’s a story full of ideas but I can’t extract the message the author intended, unless that message is simply “there is no perfect political system, but anything is better than fascism”. 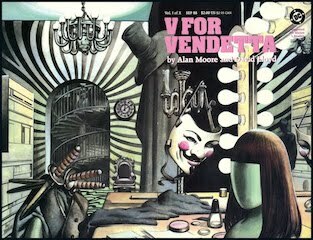 Alan Moore has disavowed himself of all film adaptations of his works, so we should consider this work separate from his comic. To be honest, I actually preferred the film version. Sure, it stripped out huge swaths of the side stories about all the political elites in the Norsefire regime, but that was my least favorite part of the comic anyway. We lose a lot of the literary references, and much of the details of this dystopia, but the film preserves all the central concepts of the comic. Visually, the Guy Fawkes image is incredibly effective, and remains very popular today in political protests and during Halloween. It has been part of the cultural lexicon and equates to fighting against fascism and oppression. V for Vendetta ends with a beautiful fireworks show as Parliament is destroyed, silently watched by the masses of citizens who have donned the Guy Fawkes masks sent by V throughout the city. It’s a nice image of revolution against fascist oppression, but my thoughts always go to the next day. What happens after the regime is overthrown? That’s when things get complicated in the real world. The film is a very stripped-down version of the more complex comic, and it may not have the exact same message, but it remains a thought-provoking and entertaining work. “I don’t imagine you can have a utopia made up only of comic book writers and artists.” No, but you could have an anarchic society made up only of them. It’d be awesome! I always thought the movie ended the way it did precisely because the film-makers, too, struggled with the idea of what sort of transitional government comes into place. In the final scene of the movie, we’re surprised at some of the faces that appear in the crowd, for reasons that I won’t go into (spoilers). But it’s clear that in blowing up Parliament, no one was hurt, exactly because Britain has surrendered its democracy… and there is literally nobody there. Great, thoughtful reviews of both forms, Stuart. Thanks!